We specialize in Vintage Muscle Car Engines. 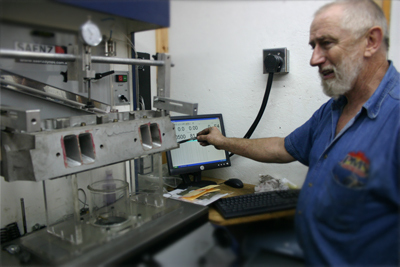 All our machining, assembly and testing services are performed in-house. Well equipped engine machine shop. Experienced machinists geared to make your engine a top performer! Precision Machine Service (PMS), Pigeon Forge Tennessee, professionally machining high performance muscle car engines and high performance racing engines of all makes and sizes, we also restore those rare and one-off antique engines for Antique Car enthusiast. Our roots began in drag racing. However, through decades of experience, experimentation, and study our expertise in building high performance engines has crossed many facets of the motor sports world. Precision Machine Service does not provide a one-size-fits-all solution, every engine is built with pride and precision according to the needs and desires of our clients. At Precision Machine Service, we see every engine as an opportunity to exceed our customer’s expectations. From the smallest modification to a 1,000 horsepower asphalt-ripping engine, Precision Machine Service does it all in-house with unmatched care and quality. Owner Dennis Hawkins says, the difference between building a good motor and a great motor isn’t getting one little part right, it’s getting all the little details right! Dennis has been custom building muscle car engines and vintage motors for over 40+ years. Thanks to Dennis and Corey I was able to be a 2 time street stick champion at Knoxville Dragway. And the first car into the 5s without them I couldn’t have done it thanks guys! Excellent shop. I’ve had plenty of work done here and always an excellent result. Awesome engine builder ,just won first place in thunder in the rock mudbog first trip out with my new PMS engine! Thanks Dennis and Corey for a fine piece of equipment. Awesome engine builder ,just won first place in thunder in the rock mudbog first trip out with my new PMS engine!thanks Dennis and Corey for a fine piece of equipment.